As a load I used a manually wound nichrome wire resistor which can be seen on the lower right of the picture attached to the aligator clips. 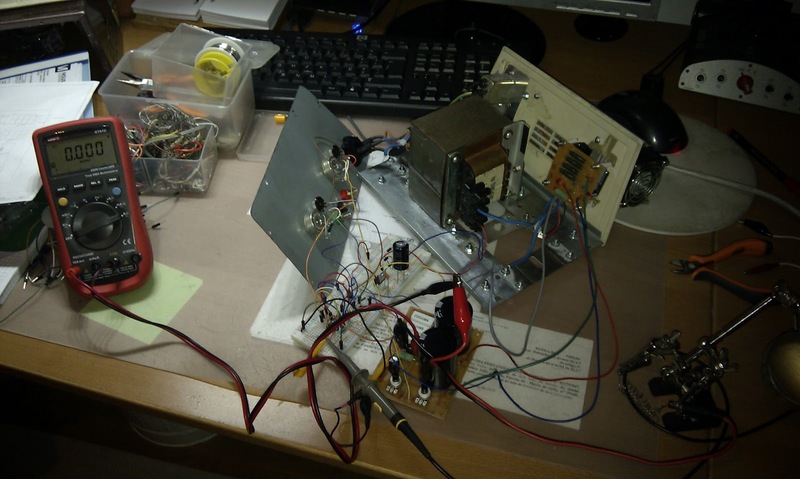 The initial test consisted of feeding the full circuit (including the bridge rectifier) with a DC current provided by my commercial lab power supply. The current limit was set to 200 mA to avoid an eventual construction mistake from damaging components. After all the wiring was done and every connection double checked, it was time to fire it up. I prepared myself emotionally to see magic smoke. But to my personal joy it was working. 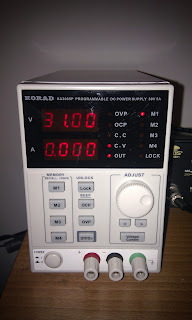 It measured an idle current of 15mA at 0 Volts output, which increased slightly as I increased the voltage knob. The test allowed me to verify that the control potentiometers needed some changes. The fine adjustment pots in series with the cursor pin of the coarse adjustment pots was not the correct setup. Also, these fine adjustment pots had the connection inverted. These issues were fixed (the first, by putting the two pots in series but in a different configuration which will be shown in a revised schematic, and the second by simply putting the shut between the opposite pin of the potentiometer and the cursor pin). With normal operation validated I decided to power the entire circuit from the power supply transformer (in the initial circuit the independent power for the regulator was already being supplied by the transformer). Everything worked as expected. As calculated the maximum attainable voltage was of 28 Volts. Without trying to push the power supply to the maximum for now, I managed to obtain 4 Amps of constant current without problems. I noticed a certain assimetry in the heating of the power transistors, with one of the 4 becoming about 7ºC hotter. This may be due to small differences in the transistors or in the 0.18 Ohm 5 Watt resistors which are in series with these BJT's. 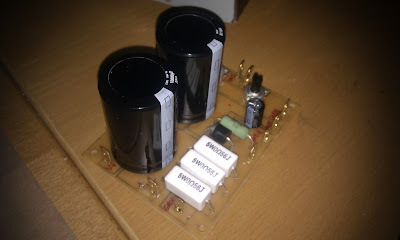 It is something that may require some tweaking in the resistors (if it is worth). Yesterday the Voltmeter and Ammeter have arrived. I found that both are based around the popular ICL7107 ADC chip (which can be found in cheap multimeters for example). I also found that the ammeter only works correctly with a floating power supply in respect to the measured current. 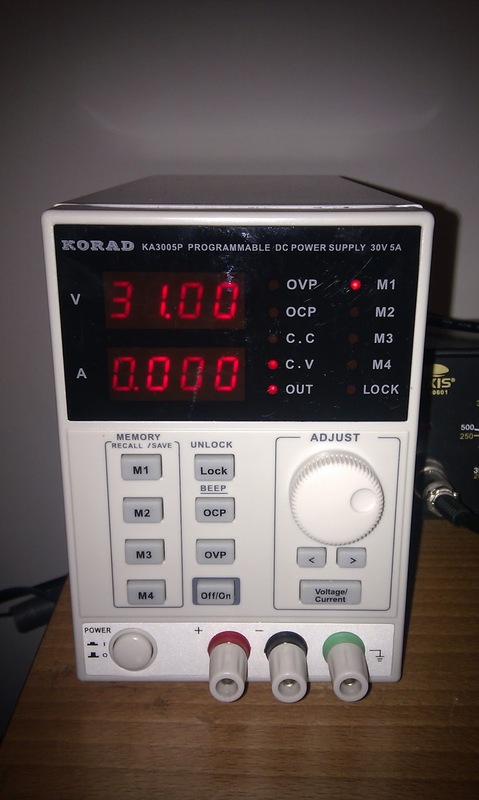 The voltmeter works well if I use the power ground instead of the signal ground to take measurements. 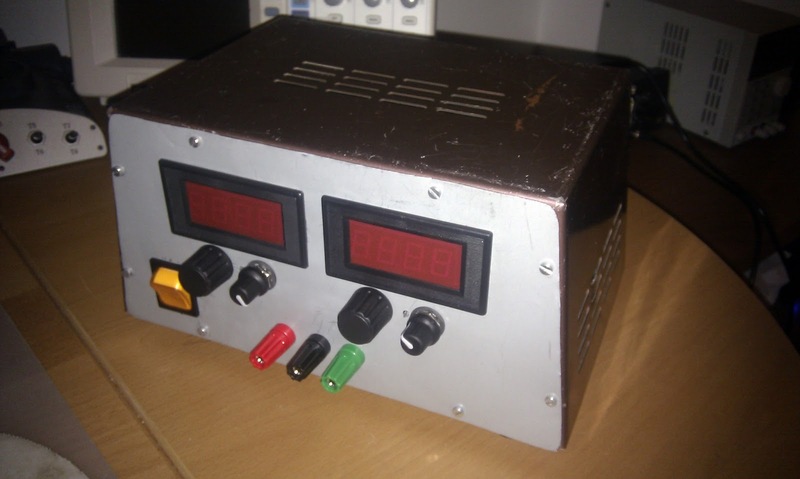 For the ammeter there is about 0.20 Ohms of resistance between the signal ground and the power ground. This is not directly applicable for the power supply, as in spite of there being separate voltage sources, the have the grounds related by a network of resistors. The small resistance between the grounds of the ammeter would prevent correct operation of the power supply (in this setup the LM723 depends on the difference between the power ground and control circuit ground).